The intense and very natural lemon scent impressed every person who likes Limoncello. The round taste with its beautiful freshness leaves a long finish. Biostilla Limoncello is excellent also with Prosecco or over icecream. Luxardo Limoncello 27,00 % 0.7 l.
Chocolate - Hazelnut spread Crema Napolitaner 300 gr. - Loacker 6,55 EUR / 20,47 €/kg. Dark chocolate with Grappa cream 53 % cocoa 100 gr. - Pichler Chocolates Osttirol 4,60 EUR / 4,60 €/100 gr. Milk chocolate with Apple Strudel 35 % cocoa 100 gr. - Pichler Chocolates Osttirol 4,60 EUR / 4,60 €/100 gr. Milk chocolate with Champagner cream 35 % cocoa 100 gr. - Pichler Chocolates Osttirol 4,60 EUR / 4,60 €/100 gr. Dark chocolate with hazelnuts 53 % cocoa 100 gr. - Pichler Chocolates Osttirol 4,60 EUR / 4,60 €/100 gr. Dark chocolate with marzipan-sea buckthorn 53 % cocoa 100 gr. - Pichler Chocolates Osttirol 4,60 EUR / 4,60 €/100 gr. Dark chocolate Raspberry 110 gr. - Venustis 9,25 EUR / 8,41 €/100 gr. Sweet Wine Chocolate Meran/o 110 gr. - Venustis 10,55 EUR / 9,59 €/100 gr. Dark chocolate with pumpkin-cream 53 % cocoa 100 gr. - Pichler Chocolates Osttirol 4,60 EUR / 4,60 €/100 gr. Milk chocolate with Alpine-rose-honey-cream 35 % cocoa 100 gr. - Pichler Chocolates Osttirol 4,60 EUR / 4,60 €/100 gr. Chocolate Dark Noir 87 gr. - Loacker 2,25 EUR / 2,59 €/100 gr. Dark chocolate with Tiramisù cream 53 % cocoa 100 gr. 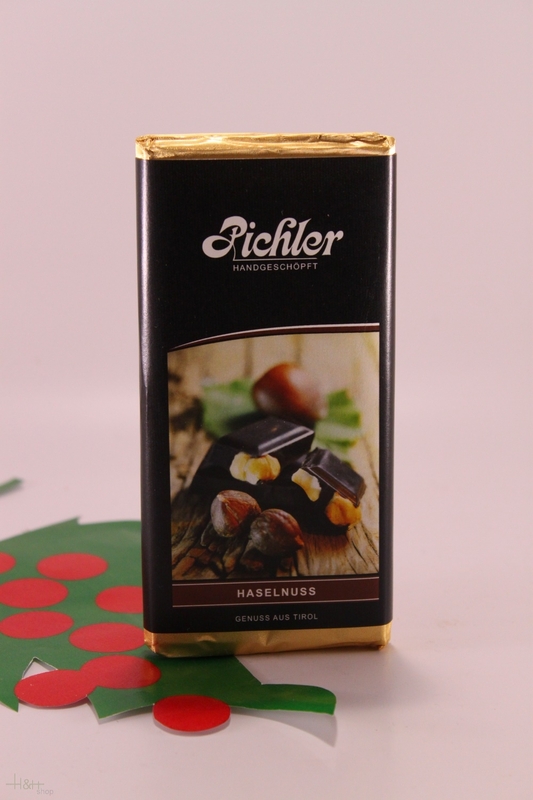 - Pichler Chocolates Osttirol 4,60 EUR / 4,60 €/100 gr.